Moscow, July 4, Interfax - The share of Russian citizens considering themselves Orthodox grew from 52% in 1997 to 68% in 2014, sociologists of the Public Opinion Foundation (FOM) said citing a poll. 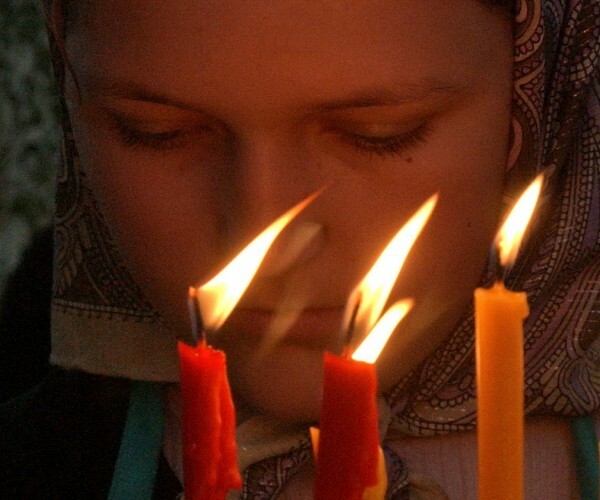 According to the survey conducted in late May in 100 cities, towns and villages in 43 Russian regions and involving 1,500 respondents, 19% of Russians do not consider themselves religious, 6% are Muslims, and 1% refer to themselves as non-Orthodox Christian confessions (Catholics, Protestants, Uniates, Baptists etc.). Only 13% of the Orthodox believers go to church once a month or more, take communion regularly, know church prayers and read morning and evening prayers, the survey showed. Moscow Orthodox respondents can be called half-church-going (29%) or little-church-going (27) but in 2014 both groups decreased 4%, while the share of those little (from 16% to 22%) or very little church-goers (from 8% to 10%) grew, sociologists said. When asked “how often do you go to church?,” 32% said they have never been there, 19% said they go to church several times a year, 18% one-two time a year, 14% less than once a year, and 8% go monthly. Russians take communion even less frequently – 63% respondents have never do it, 10% each – less than once year or once or twice a year, and 4% several times a year, the poll showed. Most respondents (76%) almost do not fast, 7% fast only during Lent, 4% during Lent and other fasts, and only 2% follow all fasts, sociologists said. At the same tine, 41% of respondents said they almost never pray, 29% pray with their own prayers, 13% with their own words and sometimes with church prayers, and 6% with church prayers alone. A total of 59% of Russians have never read the New Testament or other Christian texts and 13% read from time to time, the poll showed.